Huawei is planning a massive unveiling of its new flagship, a device codenamed ‘Mulan’, and expected to arrive on shelves as the Huawei Glory 6, or Honor 6, but images of the new phone have already leaked out. The Huawei ‘Mulan’ is said to be a 5-inch device that features a sleek design and using capacitive buttons right below the display (no on-screen keys here). On the back, you can see the 13-megapixel main camera and right below, what looks like a fingerprint sensor. It's worth noting that we've seen earlier leaks showing a different design, so we’re clearly still in a phase where the final design is up for debate. The rest of the specs, however, have been repeated time and time again: a 5-inch 1080 x 1920-pixel Full HD display, an 8-core Kirin 920 processor clocked at 1.3GHz per core, 3GB of RAM, and a 13MP main camera, as well as a secondary 5MP one. Until the handset becomes offcial nothing is certain, of course, but the technical details seem likely to be true. The Huawei Mulan is expected to make its official entry at an event in Beijing on June 24th. Here's to hoping we get to see this device in markets outside of China as well. Yep that was what I was thinking, looks like my white Note 2. Galaxy S 3.5, is that you?? Galaxy S3 and G2, is that your baby? glosy plastic back is a bad choice. Does it come with espionage malware too? Well we have the NSA here in the US, so same thing I suppose. Looks a lot like samsung galaxy s5! Huawei why did you stop doing your beautiful designs? I'll wait for the People's Republic Army version. It should to look good in red and green matte. 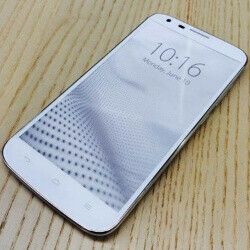 Its has similarities with Honor 3x. Nonetheless it looks like a false pic or probably a experimental prototype,. FullHD??? The last slide says QHD. That's so ugly, I think it's fake. It doesn't look like Note 2 . It doesn't have a stupid physical button . What ever Huawei designs some critics will call it a copy . I ask the critics , what they should design . Every smartphones has some similarities with others . I'll stick to my 5S and S5.